Beer and food are a natural pairing and as much as we love to drink beer while eating, it's also great to cook with and is always nice with poultry. This recipe is a perfect way to cook your turkey with your favorite ale. What's great about this recipe it it's just as easy as your average roasted turkey. Essentially, you're taking all of the necessary steps needed to create the best bird and simply using a butter-infused beer for basting. This will create a great flavor on the bird and add to its natural juices, ensuring your turkey comes out nice and moist. This beer-basted turkey recipe came from Magic Hat Brewing Company of South Burlington, Vermont. The brewer makes a fantastic line of craft beers and they suggest using their #9 Not Quite Pale Ale, but you can substitute in any of your favorite pale ales. To add a different dimension to the basting juices, you may also think about using a fruit beer. Adjust the oven racks so the turkey will fit in the oven and preheat to 325 F.
Rinse the turkey inside and out under cold running water and pat dry with paper towels. Season both the inside and outside with salt and pepper. Stuff the bird, if desired. If you are not making stuffing, insert something into the body cavity that will flavor the meat. This can be a halved lemon or orange, a stalk of celery, a few garlic cloves, halved onion, or some bay leaves. A compound butter of herbs like rosemary, sage, and thyme is an excellent option as well. Melt the butter and stir in one bottle of ale. Pour the butter-beer mixture over the turkey. Cook an un-stuffed bird for about 15 minutes per pound, cook a stuffed bird for about 20 minutes per pound. While roasting, baste the turkey every 20 minutes or so with the beer-butter and pan juices that have accumulated in the bottom of the roasting pan. About halfway through the cooking, pour the remaining bottle of beer over the turkey and continue basting. 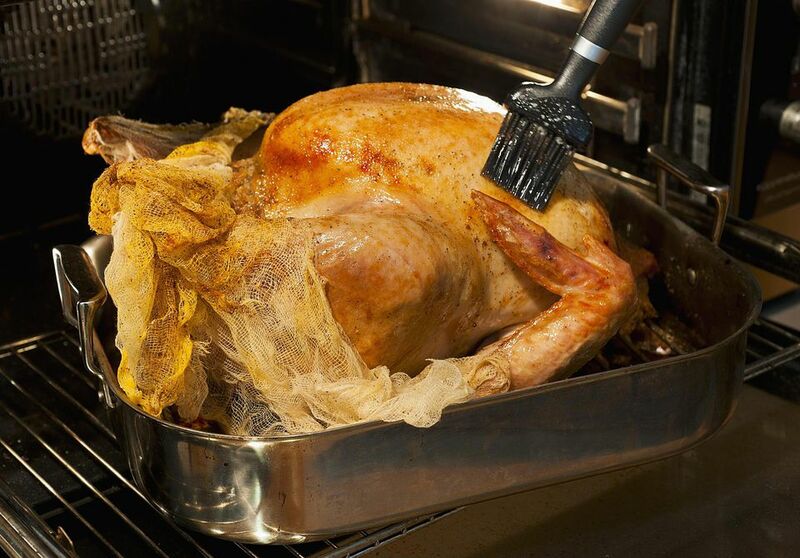 Cover the breast and drumsticks with foil if they start browning too early. When a meat or instant-read thermometer inserted into the thickest part of the thigh registers at least 180 F, the turkey is done. If stuffed, the stuffing should register at least 160 F.